This is the story of a remarkable family during the Civil War. Seven daughters, one son, and their mother contributed their services to the Union cause. The book, based on the personal letters and diaries of the Woolsey family of New York, was written by Eliza Howland and Georgeanna Woolsey in 1898 but has never been published until now. This edition includes photographs of the Woolsey family, an introduction by Daniel J. Hoisington, and an index. 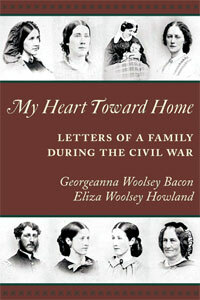 My Heart Toward Home: Letters of a Family During the Civil War is an important new source for Civil War reenactors and researchers. Based on the letters and journal entries of the Woolsey family of New York, it is a treasure-trove of primary source material."